The atmosphere of the French Riviera is unique. The picturesque port cities and towns, the scents of the sea, wine, olives, and luxurious perfumes have a magic that the world’s elite discovered long ago. Throughout the 20th century, the Côte d’Azur area has been a destination for luxurious vacations that Europeans don’t have to travel half-way around the world to enjoy. http://nice.radissonsas.com – Take the brunch on the roof, in front of the Promenade des Anglais. Favorite shop: CAP 3000, Saint-Laurent du Var, tel. +33 493 31 10 35, www.cap3000.com – Many of the stores in the commercial center. Advice: A fun trip is to fly from Cannes to Monaco by helicopter (great scenery), but if you want to discover the region (lakes, canyons, etc.) rent a motorcycle. – In a hotel near Cannes and 10 km from Antibes. The guidebook Gault et Millau evaluated it with 16/20 points and one chef’s cap. Favorite site: Juan les Pins beach in the old Romanesque city of Antibes with costal wall – built around 2000 years BC. Advice: Book three months in advance for holidays in June, July and August. of Provence. Hotel with a view of the sea and one of the most beautiful and most difficult golf courses in France. There is the first Statue of Liberty in the square, by the sculptor Bartoldi from Strasbourg. Best-kept secret: Wine area Bandol, where one of the world’s most healthy red wine is grown (contains iodine, sea salt and up to 6% of iron). A world cradle of rose wines since 5000 BC. Wine testing from private cellars, in the most famous castles – like Chateau Pradeaux, Chateau des Salettes, and domains like Pibarnon, Terrebrune, La Laidiere, La Noblesse, La Cadierenne, and L’Estagnole. Also diving – among the most beautiful water fauna and flora from all the Côte d’Azur. Advice: Make sure that you have enough money and that your liver is in good condition. Time zone: GMT +1 (GMT + 2 from last Sunday in March to last Sunday in October). www.francetourism.com/practicalinfo/regions.htm – French Riviera at a glance, with especially useful highlights for particular Riviera cities. www.provenceweb.fr/f/region1.htm – Exhaustive and well-arranged guide for all of southern France. Includes plenty of photos and practical maps. www.guideriviera.com/ – Classical, rather commercial guide of Riviera tourist office, dedicated mostly to accommodation, sight-seeing and cultural events. www.ccinice-cote-azur.com/ – Web page of Riviera business chamber, containing useful advice for those who plan to establish a business in the region. http://town.hall.org/travel/france/rivierap.html – Basic facts about the Riviera, including annual culture calendar. · France’s second largest airport, in Nice, is the best connection to the Riviera with direct flights to 90 countries. But if you’re already in France, it’s worth it to take the high-speed TGV train, which links the Riviera with all of France’s regions and all major European cities. · The same great conditions exist here for sports like water skiing and sailing as for golf, tennis, and horseback riding. For those who see casinos as adrenaline sports, there are 13 of them on the Riviera. Not far from the coast there are good conditions for winter sports, as well. 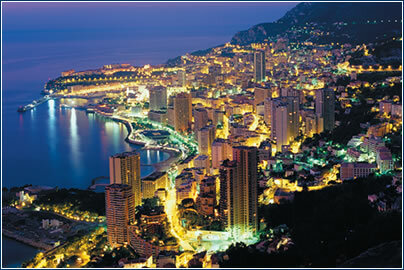 · This year the 58th annual Cannes Film Festival will take place between 11 and 22 May. The Monaco Formula I Grand Prix, and the Festival of Roses in Grasse are both in mid-May, and the jazz festival in Nice and Juan les Pins are both in the second half of July. · The area stands out with its typical, rather dietary cuisine based mainly on fish and vegetables. If you want to taste truly typical dishes, try bouillabaisse, fish soup, anchoyade, soupe au pistou, pissaladiŹre, ratatouille, and Nićoise salad. The herbal aperitif pastis is the favorite noon-time quaff. · The sun shines almost 300 days a year on the Riviera. The Mediterranean climate brings pleasant temperatures year-round. Hot, dry summers alternate with pleasant springs and autumns that are good for traveling. Ample rain allows everything to stay delightfully green, but it usually rains more in February and November. Freezes are rare in the winter. · When you leave the Côte d’Azur you must take along a whiff of the world’s perfume capital, Grasse. You shouldn’t leave without some local honey and lavender, or a glass of the renowned brands Biot and Vallauris. Don’t forget a few bottles of the outstanding local wine, which is distinctive with its fresh taste and fruity aroma.